Chloe Woodruff (born July 21, 1987) is an American cross-country cyclist. She placed 14th in the women's cross-country race at the 2016 Summer Olympics. 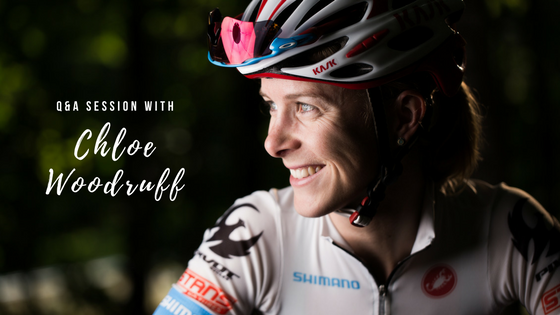 Woodruff participated in the 2017 Women's Ride Calendar for Little Bellas, and we caught up with her to chat about some very important questions we had weighing on our mind. What is the biggest obstacle you've overcome? Self-doubt. There have been periods over the past few years where I've questioned my ability to 'make-it' in this sport. I've learned to reframe those doubts and redefine success in my mind. What do you do when you don't think you can go on? I remind myself that these are the days that make me stronger. You can't give up when things get tough, because there are so many tough days in sport. But the good days make it all worth it. What is your biggest source of energy? Breakfast. Who are your role models and/or sources of inspiration? In mountain biking there are quite a few, but Katerina Nash comes to mind. She's had such a prolific career and is competitive across disciplines. She's honest about how her motivation can fluctuate--which is relatable to so many. What are your favorite tv shows, movies, books, iphone apps? Parks & Recreation, Despicable Me, The Dog Who Wouldn't Be, I don't have an Iphone. What is your preferred pre/post race music? Hip-hop. What is your favorite non-race outfit? Loungewear. When have you felt your strongest or most courageous? When I've been able to pick myself up after defeat. What is your spirit animal? Roadrunner. What does the last text message on your phone say? If you don't hear back I'm sleeping. What were you like in high school? Independent, idealistic, and a sensitive introvert. How would your best friend describe you? That'd be my twin sister and she described me as the "evil twin" in her maid of honor speech at my wedding. But that's something of a joke between us. What's your favorite 90s jam? Loser by Beck. What would the name of your debut album be? Don't Listen to This. What is your favorite cheese? Parmesan. What are you afraid of? Lightning. Who Really Uses Positive Self Talk? I Do! Mom and Bikes and All Things Great! A Girl and Her Bike: Let’s Add This Up! The Little Bellas is a mountain bike organization whose goal is to help young women realize their potential through cycling. We aim to create a community that will empower girls through the sport, emphasize the importance of goal-setting, promote healthy life styles and recognize the positive effects of strong female bonds. While this program is centered around creating camaraderie for girls on bikes, it is most importantly about having fun in a constructive environment.